Knowledge and books are power! We invite you to join our new Healing Tribe. This is open to those who want to learn and enhance their spiritual lives from an African Perspective. We will have classes, guided meditations, discussions with elders, rituals and more via our private group and anymeeting.com. There will be live classes from our Temple in Atlanta and space for questions and answers. If you are ready to move to the next level on your spiritual journey this is for you. Classes will meet on Wednesdays, twice a month and will be recorded for others to view in their own time. Our tuition is $25 per class which can be paid on eventbrite or you can pay $50 per month to receive membership into the group, classes and other activities. 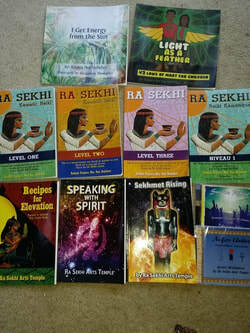 Join our book club to receive books, CDs and more from Ra Sekhi Arts Temple that will help raise your consciousness and vibration. You will also be added to our detox email list. You will receive our newsletter with specials and updates on classes and retreats.